Grid Reference: OS Landranger 66 (Edinburgh inc Penicuik & N Berwick) - GR 233 632. Grade: Medium to Difficult. The first half of the walk is very easy, along roads and tracks, but it is a steep ascent to Carnethy Hill. I have considered running in the Carnethy Hill Race several times now, but was never quite sure what these hills would be like to run....or that's what I told myself....maybe I was just finding an excuse! So one cold winters day I decided to climb these hills to see whether I was up to the challenge of the race. 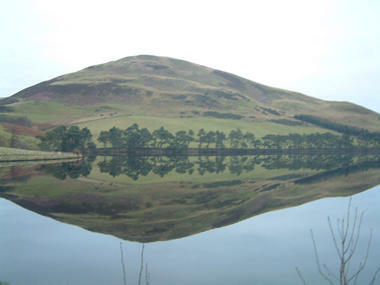 The hills form part of the southern edge of the Pentlands, providing views south across Penicuik to the Lammermuir and Moorfoot Hills, and can be climbed either individually, together or in conjuction other hills such as Scald Law, West Kip and East Kip. Either way these hills provide an excellent afternoon walk whether it is the middle of winter or one of our "summer" days (if there is a difference....). After parking the car in the car park, walk up the road for 1 ½ km until just beyond Glen Cottage when the first view of Glencorse Reservoir is obtained. Upon reaching the col, walkers should follow the path that veers east and heads up the broad ridge towards the summit of Carnethy Hill (GR 204 619). 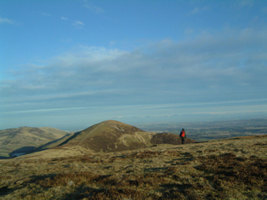 Some walkers may wish to climb the summit of Scald Law, which involves ascending the path to the west of the col and retracing your steps upon reaching the summit. From the summit of Carnethy Hill, continue east on the ridge path towards Turnhouse Hill (GR 213 627). After crossing the burn a signpost points walkers in the direction of the surfaced road, which should be followed for approximately ½ km to the car park (GR 233 632). 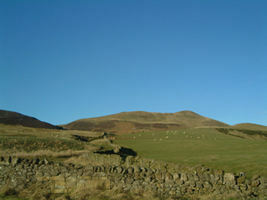 Alternative route: These hills can be climbed by including Scald Law, West Kip and East Kip in the walk. Walkers can either start from the car park near Threipmuir Reservoir (GR 167 639) or Nine Mile Burn on the A702 (GR 177 577).